Roughly a year ago, Brazilian grappling sensation Alex “Little Rock” Silva was on top of the world, having defeated long-time titleholder Yoshitaka “Nobita” Naito to become the ONE Strawweight World Champion. Silva’s reign would last just around five months however, as Naito would get the better of Silva in a dominant rematch victory. Now, after seven months on the shelf, Silva makes his long-awaited return to the ONE stage when he takes on Japan’s Yosuke “Tobizaru” Saruta at ONE: DESTINY OF CHAMPIONS on Friday, 7 December at the Axiata Arena in Kuala Lumpur, Malaysia. “I am very excited to be back. I can’t wait to get back in the cage,” Silva shared on the ONE Championship website. During his time away from action, Silva, who is decorated Brazilian Jiu-Jitsu practitioner with a third-degree black belt, said that he’s been working to hone his grappling skills even more, this time by working on his wrestling acumen. Time is of the essence for the 36-year old Evolve MMA product, who’s looking to regain his world championship sooner rather than later. The title that Silva once held is now around the waist of Filipino star Joshua Pacio, who wrestled the title away from Naito back in September. Before thinking about the world championship however, Silva will first need to get past Saruta, who won’t be an easy assignment. “Tobizaru” may be a newcomer on the ONE Championship stage, but the Saitama, Japan native is exponentially more experienced compared to Silva in terms of bouts. 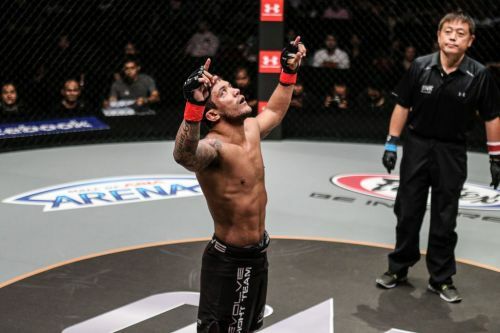 The former Shooto Strawweight Champion has won four of his last five bouts, and is hungry to bounce back and make an immediate impact on the ONE stage. While Saruta does have a ton of experience behind him, Silva isn’t too focused on what his opponent brings to the table, but rather his own capabilities. “I don’t focus too much on my opponent’s strengths and weaknesses. I focus on my strengths and concentrate on how I’m going to implement my game and get the win,” he added. Silva is confident that he’ll have his hand raised without having to go to the judges’ scorecards. “Let’s see how the fight goes, but if I had to pick, I think I’ll finish him in the second round,” he concluded.